After 99 years, it came down to Alexis Sánchez against Sergio Romero from 12 yards. The Arsenal forward attempted a Panenka, scuffed it badly, and scored anyway as the goalkeeper dived to his left. 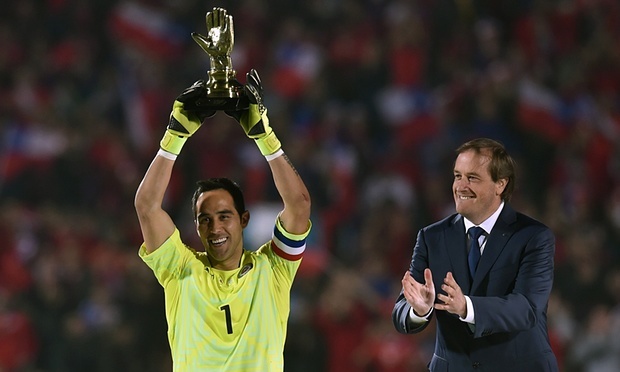 Misses from Gonzalo Higuaín and Éver Banega in the shootout proved decisive and, finally, Chile, one of the four participants at the inaugural Copa América, had a first international trophy. For Argentina the drought goes on: 22 years since their last trophy and an increasing sense that this gifted generation of players will remain unfulfilled. Where better to achieve that first win than at home, asked Claudio Bravo on Friday; this wasn’t just about doing it in front of local fans. Few stadiums in the world have such symbolic value as Santiago’s Estadio Nacional in being representative of their nation. Behind the goal at one end a block is left perpetually empty, the benches still as they were in 1973 when the stadium was used as a prison camp after the coup through which Augusto Pinochet seized power. It was here that November that Chile kicked off against no opposition in a notorious World Cup qualifying play-off after the USSR refused to take to the field in a stadium in which leftists had been murdered a matter of weeks earlier. Above it is the legend Un pueblo sin memoria es un pueblo sin futuro – a people without a memory is a people without a future. The atmosphere before kick-off was extraordinary, small dashes of albiceleste breaking a great sweep of red, each of the home fans waving the national flags they’d been given as they came in. And beyond the stands, visible through the haze of dust and pollution for the first time in the tournament, loomed the rocky bulk of the Andes, an appropriately grand backdrop to the biggest game in Chile’s history.